I apologize for not posting any updates recently, but I have been busy preparing to travel and then actually traveling. Before my trip, I decided that I wanted a new bag to take with me. I had looked in several stores for something that I liked. I didn't find anything, so I opted to make my own. 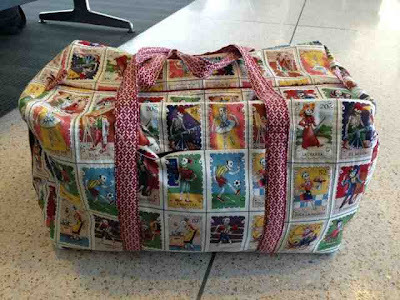 Using Studio Cherie's Travel Duffle pattern that I picked up on Craftsy, I crafted an awesome bag. It fit in the overhead bin without issue, and there was nothing like it that we saw. I made a couple of tweaks to the pattern including adding a zipped pocket on the 2nd end, using double folded cotton in place of jute for the handles, and substituting lighter weight dream cotton batting for more rigid, shape holding batting. It is totally washable and folds almost totally flat. I love it. The main fabric is Cartas Marcadas from Alexander Henry and Cross Town from the Sweetwater's Hometown collection for Moda. Sitting at the gate waiting impatiently to board the plane. My travels took me to Dallas, Texas. I had the opportunity to visit two wonderful stores. The first was CityCraft. What a great store it was, so much thanks to my amazing sister-in-law for the recommendation. They had an excellent selection of high quality fabric imported from Japan as well as great pics from Alexander Henry, Michael Miller, Art Gallery Fabrics and more. I picked up a half yard of each of a few different fabrics. They offer some cool looking classes too. If I lived in Dallas, I'm sure I would be enrolling in some. The second store was The Quilt Asylum in McKinney, Texas (a northern suburb of Dallas). This shop ranks at the top of my list for all of the fabric shops I've visited. I was floored when I first walked in because everything is well illuminated and well organized. They had fat quarters for just about everything I looked at. There were also many pre-cut options for those of us who use them. 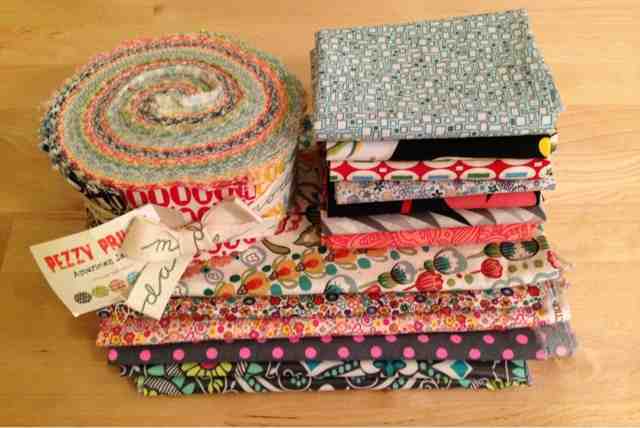 I picked up a bunch of fat quarters, yardage, and a jelly roll. Like CityCraft, the store offers some cool classes. Most of the classes are quilting based, but that is to be expected of any store with quilt in the name. I can say with almost 100% certainty that I will be returning to the store the next time I'm in the Dallas area. Some of the fabrics from my trip to Dallas.